Arsenal midfielder Aaron Ramsey is reportedly planning to put a hold on contract talks with the club until the January transfer window. The Wales international has been a key player for the Gunners, and they won’t want to risk losing him, but that’s looking more and more of a possibility as time goes on. Ramsey’s contract situation has been in the headlines for some months now, and it looks like he’s in no rush to extend despite being in the final year of his deal. That’s because he is said to be planning the tactic used by team-mate Mesut Ozil last season to get as much money as possible out of the club, according to the Daily Mail. The 27-year-old would likely be able to demand much more money by January as by that point he’d technically be free to sign a pre-agreement with a foreign club ahead of a free transfer at the end of the season. The Mail claim Ozil used this method last season by leaving his contract extension until late on, eventually earning him wages of around £300,000 per week. 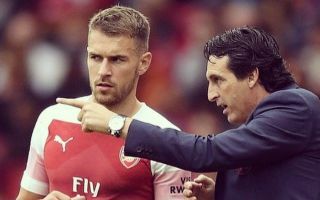 Ramsey is of similar importance to the Gunners and they could really do with sorting this situation out, with the Mail claiming manager Unai Emery sees the player as a key part of his plans and is pushing his club to ensure they keep him.